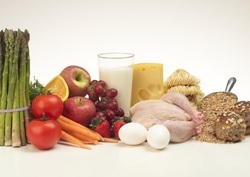 Correct nutrition is a crucial part in our over all health and wellbeing. Without adequate nutrients our bodies will not have enough energy to sustain life. Making sure that we have a balanced diet is probably the trickiest part. We need to have enough grains, protein, dairy, fruit and vegetables to provide fuel for our bodies. So, to make it simple - I have compiled a sample daily food allowance chart and serving size guidelines (using the Australian Dietary Guidelines Summary which you can see by clicking the link below).